COS COB, Conn.--(BUSINESS WIRE)--Just in time for summer, a frozen classic has returned. The amazingly delicious Original Chipwich® ice cream cookie sandwich is back with all-natural cookies, real chocolate chips and premium ice cream. 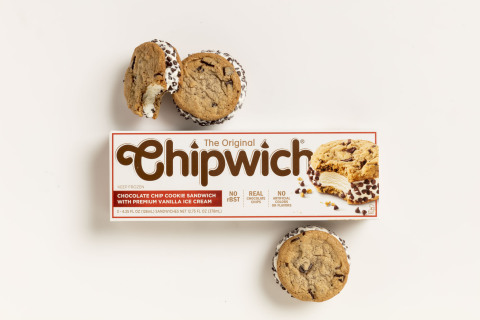 The Original Chipwich is available major grocery and convenience stores in the northeast United States from Philadelphia to Boston, with more being added daily. Thirty-seven years ago, the Chipwich became an instant classic. At its height, it earned the title as one of the top 10 iconic snack brands in America. Then, in 2011, the brand disappeared from store shelves, leaving behind a sad collection of copycats offering subpar ingredients and an even sadder eating experience. But those days are gone. Today’s Chipwich doesn’t skimp on ingredients or flavor. It’s a perfectly balanced, three-in-one indulgence: premium vanilla ice cream sandwiched between two sweet, chewy chocolate chunk cookies and then rolled in crunchy, real chocolate chips—the signature detail that makes a Chipwich a Chipwich. For product information and updates, please visit www.theoriginalchipwich.com or follow Chipwich on Facebook, Instagram and Twitter. Stewart’s Shops, Wegmans, and more. First introduced on the streets of New York City in May 1981, the Original Chipwich® ice cream cookie sandwich became an instant sensation. Combining two classic treats – chocolate chip cookies and premium ice cream, Chipwich has something for everyone. At the height of its popularity, Chipwich was ranked as one of the top 10 iconic snacks in America by TIME Magazine. Crave Better Foods acquired the Original Chipwich trademark in 2017 and has since updated the ingredients of this beloved classic, premium ice cream treat. About Crave Better Foods, Inc. Founded by packaged goods industry veteran David Clarke, in collaboration with Cannon Capital, Crave Better Foods is on a mission to find and revitalize authentic, well-loved brands. Crave Better products are made with integrity and premium ingredients to deliver authentic experiences and great taste that today’s consumers demand. Cannon Capital is a private-equity firm focused on helping adolescent companies develop into elite organizations. Cannon leverages its unique entrepreneurial, operational and financial backgrounds to help companies reach their full potential. Cannon’s investment strategy breaks the barrier between lower-middle-market private equity/special situations and late-stage venture. The Original Chipwich is a registered trademark of Crave Better Foods, Inc.
TIME Magazine is a registered trademark of Meredith Corp. The Original Chipwich ice cream cookie sandwich returns to stores better than before, with premium ice cream and all-natural chocolate chunk cookies.